We spent the better part of the day hauling decorations down from the attic and up from the garage to deck the halls. We did take a break to go to a tree-trimming party, so I’m still vacuuming up needles and stray bits inside, but the outside is pretty well finished. I think we may add a garland around the front door. Another option is to put a bunch (or swag, if you prefer) of evergreen under each porch lamp. We have a boxwood wreath on the red door, but, of course, it isn’t lit. Gorgeous! Very inviting. Red bows on the lamps. Really gorgeous!! I love the evening image! Do come and enter my Giveaway from Fifi Flowers valued at $200! I think it looks beautiful! Your house is charming. If you feel you must add more greenery, I would add something tall to the urns on either side of the door. The white branches look nice, and some evergreen, with perhaps a bit of red, would pop against your white wood house. But really, I think you've done a wonderful job. Your home looks gorgeous! So festive and warm and welcoming! i would never presume to suggest a thing. thank you for treating us! Oh my, it looks absolutely breathtaking as is. So, so pretty!! Love both your home and your decorations!! 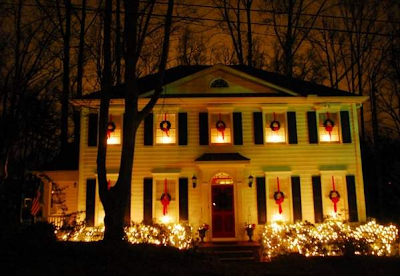 If my house was symmetrical like yours I would also do wreaths on the windows - just love that classic Christmas look!! I love the wreaths in all the windows and the white lights glowing from the boxwoods. So pretty! Your home is beautiful! Happy Hoidays from your newest follower. Oh my! Your home is truly gorgeous and it is my favorite style of house by a long shot. You did it up so perfectly for Christmas! Thank you so much for linking up to the Inspiration Friday party! What a gorgeous home! I think it is perfect just the way it is.